North Little Rock, AR - The Arkansas Travelers 2018 season was a banner campaign that saw the team make a playoff appearance while sporting the Texas League's Player of the Year. For the first time in seven seasons, the Travs earned a first half championship in the North Division by virtue of winning a dramatic one-game tiebreaker against Northwest Arkansas on the opening day of the second half. The season saw the Travs post an overall record of 71-68 and marked their second year as an affiliate of the Seattle Mariners. Here's a look back at some of the highlights for the team and players. For the first time since 2011, the Travelers won the first half championship of the North Division. At the end of the 70-game first half, Arkansas and Northwest Arkansas were tied with identical 35-35 records. The first half tiebreaker is a one-game playoff in the first scheduled meeting of the second half creating a dramatic winner-take-all game on the opening night of the second half. With about three weeks to go in the half, the Travs had been in last place but ran off wins in eight of their next 11 games to surge into first. They had two chances to clinch the championship without a tie but dropped consecutive contests to the Naturals on the last two days of the half necessitating the tiebreaking game. In that game on June 19, Arkansas jumped out early with a two-run homer from Joey Curletta in the first inning. Four more tallies in the third inning built up a six-run lead. On the mound, Johendi Jiminian carried a shutout through five innings and finished with just one run allowed over six innings in picking up the win. The Travelers won the game by a 7-1 final score. They would go on to post a 36-33 record in the second half of the season. With the first half championship, the Travelers qualified for the playoffs. It marked the first playoff appearance for the franchise since 2015. Their opponent was the Tulsa Drillers who were the second half champions in the North Division. The Travs took game one at Dickey-Stephens Park in thrilling fashion on a two-run walk-off hit from Joseph Odom in the bottom of the ninth inning. Despite having starting pitcher Williams Perez leave in the second inning after being struck in the arm by a line drive, Arkansas led most of the game before Keibert Ruiz homered to give Tulsa the lead before Odom's heroics saved the day. Tulsa bounced back the next night to even the series with a 6-0 shutout. Shifting to Tulsa for game three, the Travs once again took the lead in the series with a 4-3 win in another nail-biter. The game was back and forth with both teams having the lead before it went to the ninth inning tied. Again, it was Odom with a clutch shot, this time a go-ahead homerun. Arkansas would be unable to win the series though as they never led in games four or five despite late rallies in both contests. In the fourth game, they came back to tie the score at two before the Drillers scored three times in the bottom of the eighth en route to a 5-3 win. Then in the decisive fifth game, Tulsa scored the first five runs before the Travs charged back with two in the eighth and another in the ninth but the game ended on a strikeout with the tying run at bat. Tulsa moved on with the series win, three games to two. The Drillers then swept the San Antonio Missions, three games to none, in the Texas League Championship Series. April 10: Joey Curletta hits a tying three-run homer in the ninth inning before Beau Amaral delivers a walk-off hit later in the inning as the Travs complete a sweep of Corpus Christi, 4-3, in a kids day game at Dickey-Stephens Park. It was the first of eight walk-off wins on the season with eight different players getting to be the walk-off hero. May 10/11: Three wins in two days over Springfield including two walk-offs! Seth Mejias-Brean caps the win on the 10th with a three-run homer then on the 11th, the Travs win twice by one run, the second victory coming on a Joseph Odom single in the bottom of the ninth. May 13: Nathan Bannister deals a complete game shutout against the Cardinals on a Sunday afternoon at DSP in a 1-0 win. Bannister goes the distance on only 103 pitches allowing four hits and a walk while striking out three. May 29: Arkansas outslugs Midland, 16-10 on the road to open a trip to the state of Texas. Braden Bishop has four hits including a homer and drives in three to lead the way. The 16 runs and 21 hits are both season-highs. June 5: The first extra inning game at DSP with the new rules of the runner starting at second base to begin all extra frames. Joe DeCarlo drives home the winning run in the bottom of the 10th in a 4-3 win. June 6: The Travs sweep Tulsa in a doubleheader to vault into first place in the division with less than two weeks to go in the half, capping a stretch of eight wins in 11 games. June 18: On the final day of the first half, Arkansas is unable to clinch the division title falling 11-10 at NW Arkansas necessitating a tiebreaker for the first half title. Travs led by five runs early before the Naturals scored 11 straight only to see the Travs come back with five more and get the tying run to the plate with two out in the ninth inning. June 28: Four pitchers combine on a 2-0 shutout of Corpus Christi on the first day out of the All-Star Break. It is part of a four-game winning streak. The Travs were the only team in the league that finished with a winning record against the Hooks who boasted the best record in all of Double-A. July 9: The finale at San Antonio is rained out, washing away the final regular season meeting ever between the two franchises. The all-time series dating to 1966 ends in a tie, 310-310. July 14: Chuck Taylor hits a grand slam to cap a five-run eighth inning as the Travs complete a four-game sweep of the Cardinals, 8-4. The win is part of eight straight for the Arkansas over Springfield in the second half of the season as the Travs finished the year 22-10 against the Cards. July 21: Mariners top-ranked prospect Kyle Lewis makes his Double-A debut in a 13-7 loss to Springfield. Lewis goes 2-3 with a walk and an RBI and becomes the Travs primary centerfielder for the rest of the season. August 14-15: The first two games of a three-game sweep in Frisco. Ashton Goudeau fires seven shutout innings and Logan Taylor hits a three-run homer in the opener, combining with two relievers on a four-hitter in a 3-0 win. The next night, Eric Filia falls a homer short of the cycle while driving home four in a 6-1 win. Williams Perez earns the win, part of a personal four-game winning streak for the right-hander who finished the regular season with seven consecutive quality starts. August 23: Arkansas wins 2-1 in 10 innings on a Dario Pizzano walk-off single. Chris Mazza dazzles with seven shutout innings before Tulsa scores in the ninth handing Matt Festa his first blown save of the season. Festa bounces back for a scoreless 10th inning as the Travs pitching staff holds the Drillers to just two hits on the night, the fewest hits allowed in a game all season. September 3: The regular season closes with an 8-3 win at NW Arkansas. The Travs batter rehabbing big leaguer Ian Kennedy for six runs over the opening four innings. Beau Amaral, Chris Mariscal and Chuck Taylor each bang out three hits as part of a 15-hit barrage. First baseman Joey Curletta was named Texas League Player of the Year in a vote of the league's managers, coaches and media members. Curletta was been a force in the heart of the Travelers lineup throughout the season, often hitting in the cleanup spot. He played in 129 games as a Trav posting a .282/.383/.482 slash line with 24 doubles, 23 home runs, 94 runs batted in and 81 walks. His RBI and walk totals lead the league while he ranked tied for second in on-base percentage, tied for third in homers and fifth in slugging percentage. Additionally, his home run, RBI and walk totals were all career highs. Voted as the starting first baseman on the North Division squad at the league's midseason All-Star game, Curletta provided many dramatic moments this season. He homered in the opening inning of the Travs winner-take-all first half title clinching win at NW Arkansas on June 19. Three times this season he belted a pair of homers in a game, including July 17 at Tulsa when his second blast put the Travs on top in the ninth inning of an eventual victory. Other homer heroics for Curletta included a tying three-run shot in the ninth inning of comeback win at home over Corpus Christi on April 10 and a go-ahead grand slam on August 11 in the seventh inning of a victory over Midland. A 24-year old from Phoenix, Arizona, Curletta had played in only 32 games at the Double-A level prior to this season. This year he became the first Traveler to lead the TL in RBI since Mike Napoli in 2005 and the first Trav to hit 20 or more homers since Randal Grichuk in 2013. The last Trav to be selected as the league's Player of the Year was Alex Yarbrough in 2014. In addition to Curletta, several other Travs were honored throughout the 2018 season. Reliever Matt Festa paced the league with 20 saves and was named a Texas League Postseason All-Star. He made a team leading 44 appearances racking up a 5-2 record and a 2.76 ERA. Over 49 innings pitched, Festa has struck out 67 while walking just 12 and allowing a .263 opponent batting average. He became the first Traveler to save 20 games in a season since Joel Peralta in 2003 and the first to lead the league in saves since Steve Montgomery (36) in 1995. A 25-year old native of Staten Island, New York, he was called up to Seattle on three different occasions making his Major League debut on July 14. Six different Travelers were given Texas League weekly awards. Outfielders Braden Bishop and Chuck Taylor each won a player of the week award while Johendi Jiminian, Nathan Bannister, Chase De Jong and Chris Mazza each took home a pitcher of the week award. Bishop was named as the TL Player of the Month for June as well. In June, Bishop slashed .379/.443/.544 for a .987 OPS with 10 walks, eight doubles, three homers, 12 runs batted in and 24 runs scored over 24 games. He led the league in batting average, on-base percentage, doubles and runs for the month. His season was cut short in July with a broken forearm suffered on a hit by pitch. At the league's midseason All-Star game, six Travelers were voted in to represent the North Division. Joey Curletta and Braden Bishop were named starters at first base and center field. Also on the squad was infielder Chris Mariscal and pitchers Nathan Bannister, Chase De Jong and Johendi Jiminian. On September 25, the Seattle Mariners announced their minor league award winners with three Travs among the honorees. Joey Curletta was named the organization's Ken Griffey, Jr. Minor League Hitter of the Year, Matt Festa was the organization's Jamie Moyer Minor League Pitcher of the Year and outfielder Braden Bishop received the Dan Wilson Minor League Community Service Award. Bishop was honored for his individual effort in the Little Rock community over the course of the season, participating in numerous community events, speaking appearances and autograph sessions. Bishop has also been a crusader for raising money and finding a cure for Alzheimer's disease throughout his career with the Mariners. After the diagnosis of his mom, Suzy Bishop, with Early-onset Alzheimer's in 2014, Braden started the 4MOM Charity and has worked tirelessly to bring awareness of this disease that has affected both him and his family. This past Spring Training, he donated money to Alzheimer's research for every hit he got, with Mariners teammates, coaches and players around the league joining in. In addition to featuring future Major Leaguers the Travelers again had a significant amount of big league flavor in 2018. Reliever Matt Festa was called up to Seattle three times over the course of the season, making his Major League debut in July. With less than a week to go in the big league season, Festa had made seven total appearances for the Mariners working eight innings and allowing two runs on 11 hits with two walks and three strikeouts. He was among Seattle's September callups along with reliever Nick Rumbelow who was with the Travs for the last 10 days of the regular season and playoffs after splitting the early part of the season between the Majors and Triple-A. Starter Chase De Jong also earned a September callup with Minnesota after he was traded by the Mariners to the Twins in a deadline deal. Additionally, De Jong, Rumbelow, Andrew Moore, Max Povse and Daniel Schlereth had all pitched in the big leagues in previous seasons. The Mariners also sent four players on Major League Injury Rehabilitation Assignments to play for the Travs. First baseman Ryon Healy played four games while pitchers Dan Altavilla, Erasmo Ramirez and Nick Vincent each made one appearance on the mound for Arkansas. Late in the summer, the Arkansas Travelers and Seattle Mariners announced an extension of their Player Development Contract to have the Travs serve as the Double-A club for the Mariners. The Player Development Contract, which would have run out at the end of the 2018 season, has been extended for two years to cover the 2019 and 2020 seasons. 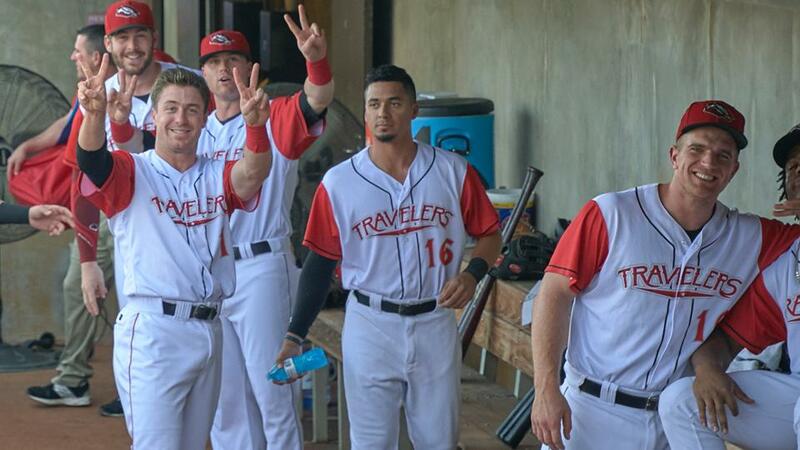 Travelers President Russ Meeks said, "We are extremely pleased to extend our Player Development Contract with the Seattle Mariners for two seasons through 2020. The Mariners are a first class organization with wonderful leadership. Jerry Dipoto and Andy McKay have ensured we have a quality product on the field and outstanding people off the field and in the community." The relationship which began in 2017 has been beneficial for both sides. "The Mariners are thrilled to continue our relationship with the Arkansas Travelers," said Mariners Executive Vice President and General Manager Jerry Dipoto. "Our development programs are built around people, process and community, all of which are plentiful with both the Travs and the loyal fans in Little Rock. We are thankful to have the Travelers as a member of our family and will remain committed to producing good baseball and an entertaining ballpark experience." Since joining the Texas League in 1966, the Travelers have had just three Major League affiliates. Seattle (2017-current) was preceded by the Los Angeles Angels of Anaheim (2001-2016) and the St. Louis Cardinals (1966-2000).